PARIS (AP) A gunman opened fire on police on Paris’ iconic Champs-Elysees boulevard Thursday night, killing one officer and wounding three people before police shot and killed him. The Islamic State group quickly claimed responsibility for the attack. French presidential candidates canceled or rescheduled last-minute campaign events ahead of Sunday’s first round vote in the tense election. Security already was a dominant theme in the race, and the violence on the sparkling boulevard threatened to weigh on voters’ decisions. Investigators were conducting searches early Friday in at least one eastern suburb of Paris, according to three police officials. Authorities were trying to determine whether the assailant had accomplices, anti-terrorism prosecutor Francois Molins told reporters at the scene. The attacker emerged from a car and used an automatic weapon to shoot at officers outside a Marks & Spencer’s store at the center of the Champs-Elysees, Molins said. Two police officers and a woman tourist were wounded, he said. The Islamic State group’s claim of responsibility just a few hours after the attack came unusually swiftly for extremist group, which has been losing territory in Iraq and Syria. Police and soldiers sealed off the area, ordering tourists back into hotels and blocking people from approaching the scene. The attacker had been flagged as an extremist, according to two police officials, speaking on condition of anonymity because they weren’t authorized to publicly discuss the investigation. Interior Ministry spokesman Pierre-Henry Brandet said officers were “deliberately” targeted. Islamic State group-inspired attacks have killed at least 235 people in France since January 2015, by far the largest casualty figure of any Western country. France remains under a state of emergency. Security has been especially high since Tuesday, when police said they thwarted a terror attack by arresting two men. 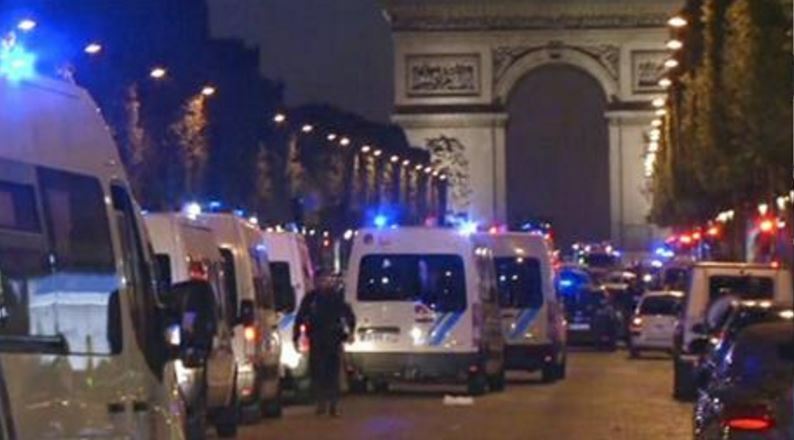 On Thursday night, emergency vehicles blocked the wide Champs-Elysees, an avenue lined with shops and normally packed with cars and tourists that cuts across central Paris between the Arc de Triomphe and the Tuileries Gardens. Subway stations were closed off. The gunfire sent scores of tourists fleeing into side streets. A witness identified only as Ines told French television station BFM that she heard a shooting and saw a man’s body on the ground before police quickly evacuated the area where she works in a shop. French President Francois Hollande said he is convinced the circumstances of the latest attack pointed to a terrorist act. Hollande held an emergency meeting with the prime minister Thursday night and planned to convene the defense council Friday morning. The incident recalled two recent attacks on soldiers providing security at prominent locations around Paris: one at the Louvre museum in February and one at Orly airport last month. Speaking in Washington during a news conference with Italian Prime Minister Paolo Gentiloni, U.S. President Donald Trump said the shooting “looks like another terrorist attack” and sent condolences to France. A French television station hosting an event with the 11 candidates running for president briefly interrupted its broadcast to report the shootings. Conservative contender Francois Fillon, who has campaigned against “Islamic totalitarianism,” said on France 2 television that he was canceling his planned campaign stops Friday. Far-right candidate Marine Le Pen, who campaigns against immigration and Islamic fundamentalism, took to Twitter to offer her sympathy for law enforcement officers “once again targeted.” She canceled a minor campaign stop, but scheduled another. Centrist candidate Emmanuel Macron offered his thoughts to the family of the dead officer. Socialist Benoit Hamon tweeted his “full support” to police against terrorism. The two top finishers in Sunday’s election will advance to a runoff on May 7.